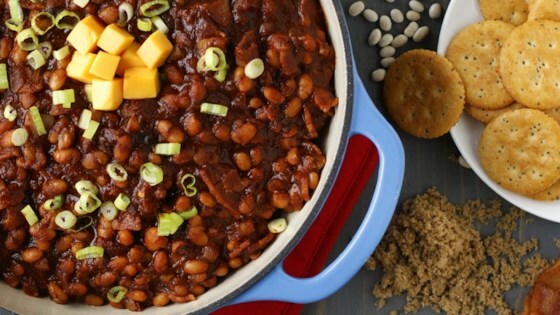 "Bacon + Beans + Beer = Boston's best. Stir with brown sugar, ketchup and McCormick® Tex-Mex Chili Seasoning Mix for a dip worthy of any game day spread. Top with Cheddar cheese, sour cream, green onion, and scoop away!" Stir in remaining ingredients. Bring to boil. Reduce heat and simmer 20 minutes, stirring occasionally. Serve dip with crackers and assorted toppings, such as cubed Cheddar cheese, sour cream and thinly sliced green onions. Cocoa you can make it with dr pepper. I put that in my BBQ.